such as: Steel, iron, sand, etc. Tongue and Groove set Produces strong, long-lasting joints for gluing the front and sides of a drawer. 4.Please wear goggles and use ear protection equipment when working. 5.Avoid getting your body or clothes close to the tool when using. 【TONGUE AND GROOVE SET】Complete your hardwood tool collection with the tongue and groove router bit set. It comes with a tongue router bit, a groove router bit ½ '' shank.With High quality material and could be used for a long time. Solid hardened steel bodies with anti kickback design.Totally enclosed and lubricated.1/2 Inch Shank. 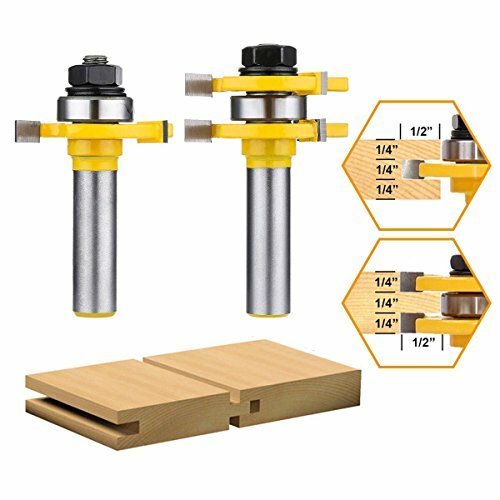 【EASY& CONVENIENT】Simple construction, easy to operate,provides much convenience to your daily woodworking.There is oil on the tongue and groove router bit's surface for helping it rotate smoothly, be careful with your hands to touch oil, gloves/cloth/paper may get some help. 【CUTTING CLEAN】 Tongue and groove set are using for hand making a drawer or other woodworking,cutters to slice smoothly into stock producing clean, splinter free.Note: router bits' edge is sharp enough, be careful when using! 【EXTRA CONVENIENCE】These tongue and groove set is truly versatile for your extra convenience. Works great with all kinds of materials and surfaces, like woods, mdf, particle boards, plywood, panels, softwood, hardwood and many others. Ideal tools for professional woodworkers and some woodwork hobbyist. 【APPLICATION】 Use these tongue and groove set tools to enhance your hardwood working performances and create beautifully handmade furniture on your own. Great for kitchen and bathroom doors, office cabinets, flooring tables, bedroom shelves, outdoor frames, walls and more. If you have any questions about this product by DRILLPRO, contact us by completing and submitting the form below. If you are looking for a specif part number, please include it with your message.